Gene has a problem. He is living a double life, involved in a diamond heist, wanted as a fugitive, and has no idea that any of this is happening! 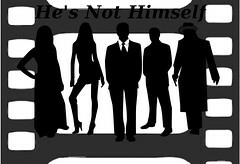 HE’S NOT HIMSELF is a musical comedy inspired by George Gershwin’s PARDON MY ENGLISH.